Working with an independent artist like Tech N9ne can be a big breakthrough for any producer, but even more so when his album reaches Billboard’s Top 5. For Soleternity, the opportunity to work with Tech N9ne was something he had to take full advantage of. 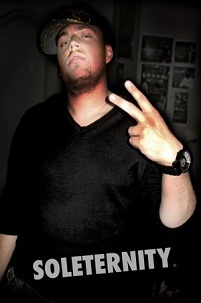 Having worked in the music industry since the age of fourteen, Soleternity has produced for several high profile names in hip hop, including major contributions to Bone Crusher’s Release The Beast in 2007. With production credits on Krizz Kaliko’s S.I.C. and Vitiligo, Soleternity set his sights on Tech N9ne. The end result was a musical collision that laid the foundation for “Technicians”, Tech’s ode to his loyal fan base. We spoke with Soleternity and asked him to share some insight on his involvement with All 6’s And 7’s, and just what is it that motivates him as a producer. What is it like to be a part of a Top 5 Billboard album? Number one, it’s a tremendous honor. I mean, honor is the best way to describe that. It’s also humbling to realize the amount of luck and good fortune that goes into being able to be a part of history like that. It’s definitely a combination of honor and humility. Of course, it’s a feeling of appreciation and gratitude to Strange Music, to Tech N9ne, Krizz Kaliko, the whole family for providing an opportunity like that. When did you find out that you would be a part of All 6’s And 7’s? Did you know you would be providing the opening track? Early this year, around February or March. Krizz Kaliko relayed the news to me. I had no idea. In fact, outside of knowing which beat it was, I had no idea what the song sounded like. I had no idea where it would fit into the album. Until the track list came out, in early May I found a track list, until that happened, I had no idea how it popped into the equation of the album whatsoever. To find out that it was at the beginning was amazing . I think that so risky for Tech N9ne to put himself out there with such a unique sounding song. I think that gamble paid off for him in a big way because he did such an amazing vocal performance on that song and a lot of people really liked that. They thought he did an amazing job. How did you come to work with Strange Music? I worked with Strange back in 07, I produced the song “Crew Cut” for Krizz Kaliko’s album. Which was a great, amazing opportunity to step into a professional relationship with Strange. I’ve always been a follower of the movements of Strange, they have a great business model and they have great artists. Did you create ‘Technicians” with a particular artist or genre in mind? I’m a very individually focused producer. When I go in to make a beat, even if I have an artist in mind, I make what I want to hear. I follow the ideas of music that I like. I did not have an artist in mind whatsoever. When I sat down to craft that track originally, I just wanted something that was electronic sounding and dubstep sounding. I noticed you have lived in several different parts of the country. Has that influenced the way you make music? It’s had a huge influence. Three days after I graduated high school, I moved to Atlanta. I had not met a single person there, but I had built a relationship with a business partner via the internet, and he allowed me to stay in his house for free. That’s where I got my start. When I came to Atlanta, I was immediately persistent to the sound. I was very much stuck in my mode, in my grind. I incorporate a lot of what I learned down there into my sound. When I was in L.A., a lot of the cultural aspects of L.A. came to influence my music. Now that I’m in the Midwest again, that is having a huge influence on my sound. I think where you’re located at, plays a very big role, even if it’s subconsciously, it plays a very big role in how your music sounds and how you feel about it. Is there a track on All 6’s And 7’s that you wish you had produced? I don’t have any producer envy, so to speak, of any of the tracks. In some regard, I wish I could have produced the entire album. If I had to pick a track on there that has really been on repeat for me- and several of them have, like the B.o.B. track is really good, a lot of tracks are really good. The track that’s been on repeat for me is “Delusional”. I think Will Power did a really great job on that beat. What tech N9ne did over it was just amazing, it kind of took me back to that classic Midwest sound. A little bit of a late 90’s, early 2000 element to it. I think “Delusional” is really tight, that’s probably my favorite song on the album. You actually perform your music live. Why is that important? I don’t want to lecture to other producers right now, but I feel like if you’re a producer in 2011, you need to understand the fundamentals of the crowd, audience participation, what makes people dance, what makes people nod their head, what makes people enjoy the musical experience. The best way, by far, to achieve that is to perform your own beats. You can do this in a number of ways, all of which I do. I’ve been all over the place doing beat battles. That’s one great way to test your music with an audience. Another great way is to do an instrumental showcase as a producer. I love to do that. Fans can hear Soleternity’s work on “Technicians” from Tech N9ne’s All 6’s And 7’s. Be sure to look out for the feature film, High And Mighty, which Soleternity wrote, produced, and scored. Click here to visit Soleternity online.